This weekend saw a series of quiet, on-field demonstrations in memory of Michael Brown and Eric Garner that demonstrate the reach of a new movement. The marches in the streets are not done. The die-ins disrupting traffic are not done. Any kind of closure for the families of Michael Brown, Eric Garner, Tamir Rice, Akai Gurley and so many others is far from done. So why should anyone be surprised that the St. Louis Rams were not done? A week after five players raised their arms in the now iconic protest pose of “hands up, don’t shoot,” wide receiver Kenny Britt took the field with the names “Michael Brown” and “Trayvon Martin” written on his cleats. His teammate Jared Cook had the words “I can’t breathe,” the last gasp of Staten Island’s Eric Garner as a police officer cut off his oxygen with a chokehold, written on his wristband. Teammate Davin Joseph had the same phrase written on his cleats. Bush’s mom has also been a police officer for twenty years, and yes, I wish I could be a fly on the wall at the Bush house this Christmas. 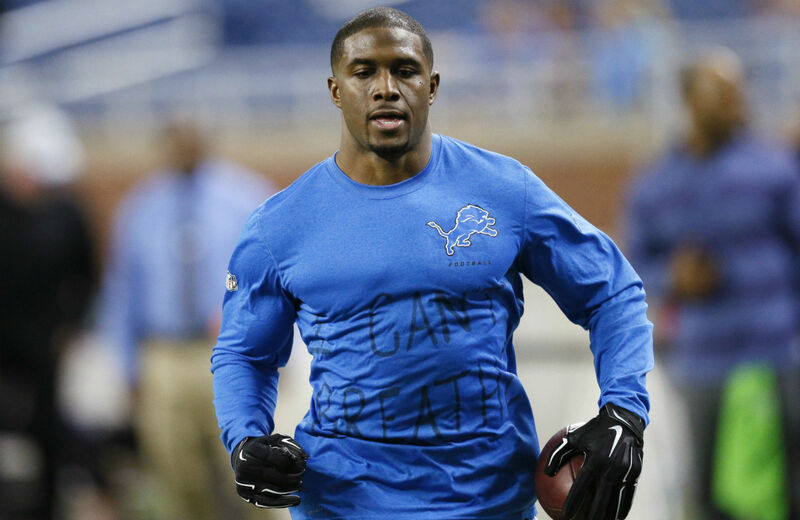 Browns cornerback Johnson Bademosi also wore an “I can’t breathe” shirt before game time, as did San Diego Chargers linebacker Melvin Ingram. Then there was Brandian Ross of the Raiders, who came out during player introductions without a helmet and with his hands up high, and Washington defensive lineman Chris Baker, who raised his hands up after a sack. Although, in Baker’s case, the gesture of anti-racism while wearing a Redskins uniform probably won’t make it onto a protest poster anytime soon. Then there is All-Star guard Damian Lillard who posted this gut-punch of a political cartoonby Rik Sansone to his Instagram account, causing the image to go viral among sports fans and protesters alike. Two members of the Oregon Ducks basketball team also raised their hands up during the pledge of allegiance the week after Knox College basketball player Ariyana Smith, playing near Ferguson in Claremont, Missouri, lay on the floor of the court and would not move for four and a half minutes, to represent the four and a half hours that Michael Brown was left in the street after dying at the hands of Darren Wilson. Each of these actions has the effect of amplifying the impact of a new struggle for human dignity in the face of racism. It has has found expression in all fifty states and in solidarity actions in cities around the world all with the message that black lives matter. Seeing the movement impinge upon the highly sanitized, deeply authoritarian world of sports is not only a reflection of just how widespread the outpouring of anger has been. These athletic protests also shape the movement, giving more people the confidence to get in the streets and puncturing the self-imposed bubbles of those who want to pretend that all is well in the world. It is politicizing sports fans and educating those who think that sports in general—and athletes in particular—have nothing to offer the struggle for a better world. I grew up in the 60s, where everybody was socially conscious. I believe in it. I’d be a hypocrite if I stood up here and told you any differently, because more than likely, some of those protests that Dr (Martin Luther) King and some of the others that took a part in non-violent protests, is the reason why I’m standing here in front of you today. This is a similar moment. Except this movement is not only explicitly about the right to live a life with more opportunity, but the right to simply live. As Howard Zinn said, “You can’t be neutral on a moving train.” The train is leaving the station, even in the world of sports.